We supply and install all pool equipment. No fuss or bother – we are the one-stop pool shop AND we come to you! Carrying a wide range of quality brands, we offer expert advice on all pool equipment to suit your needs and budget. We are happy to provide an obligation-free quote today. It is important to not only have quality, but essential to also have a correctly suited product. Equipment such as pool pumps, chlorinators, filters, ionisers, automatic cleaners and more, must be correctly sized for performance and capacity to each different pool. Pool usage rates and the environment around a pool will also dictate the pool equipment best suited. 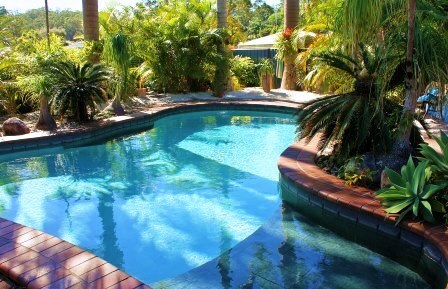 Our experience and knowledge that comes with servicing, cleaning and installing equipment in all types of new and existing pools all over the Sunshine Coast delivers pool insurance to our clients. Too often we come accross new pools with the wrong type of pool equipment or plumbing, or sometimes on an existing pool where a poor replacement choice has been made. This often leads to a green and stained pool. Please don’t let this happen to you, call us to arrange a visit and insure your pool! Pool Clear will ensure you have the correct equipment and plumbing best suited to your new pool or existing pool, including all operating systems and servicing needs. We take care of the lot – so you don’t have to! We take care of the lot – so you don’t have to!